Justin Brasell and Lisa Bovermann are providing healthcare leasing services. 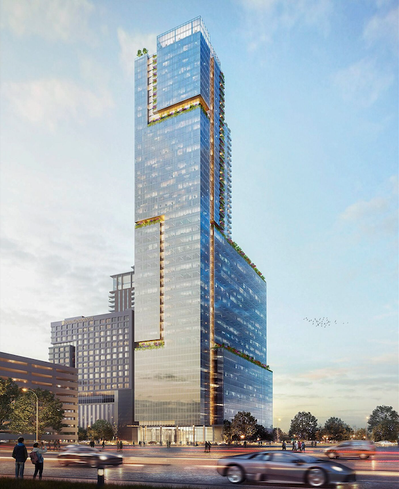 HOUSTON – Transwestern today announces it has been retained to provide leasing services for Innovation Tower, a 48-story, 1.6 million-square-foot, mixed-use development in the Texas Medical Center. Transwestern’s Executive Vice President Justin Brasell and Senior Vice President Lisa Bovermann are providing healthcare leasing services for the project on behalf of Medistar Corp. Construction is slated to begin in the end of the third quarter of 2019. Focused first on meeting needs of biomedical, technology and healthcare users at the Texas Medical Center, Medistar is developing this iconic tower in two phases. Phase 1 offers 476,500 square feet of medical and life science office space with 35,000-square-foot floorplates above a parking garage for 1,700 vehicles, with retail and a penthouse-level restaurant and lounge. Medistar will develop Phase 2 to respond to market demands, with the possibility to include 410 luxury high-rise residential units or additional medical, biomedical and life science office space. Innovation Tower will offer exceptional convenience to the world-class Texas Medical Center, Rice University, Rice Village, the Museum District, the Houston Zoo, Hermann Park Golf Course and Houston’s cosmopolitan culinary and art scene. Innovation Tower will be further differentiated by its direct connectivity to the recently completed and adjacent InterContinental Houston Medical Center hotel at 6750 Main St. and 35-story LATITUDE Med Center apartment tower at 1850 Old Main St.
Transwestern’s Houston healthcare team has executed 522 healthcare transactions during the last 24 months and more than 2,000 transactions during the past five years. This project brings the team’s healthcare leasing and management portfolio to 69 properties totaling more than 5 million square feet on behalf of some of the largest healthcare institutions in the country, including Memorial Hermann, Baylor College of Medicine, Texas Children’s Hospital and HCP.